On December 11th 1878, Sir Henry Bartle Frere, who had been appointed High Commissioner the previous year, without approval from the British Government, issued Zulu King Cetshwayo with an impossible ultimatum. When he failed to comply within 30 days, Sir Henry then ordered Lord Chelmsford, commander in chief of the British forces, to proceed with an already planned invasion of Zululand. The backbone of the invading force consisted of 12 regular infantry companies, comprising more than 4 000 troops. Because it was the rainy season, the British advance was slow. And the Zulu impis had already begun to assemble at Ulundi for the First Fruits Ceremony, so Cetshwayo had 24 000 men ready and available, which he despatched across the White Umfolozi. 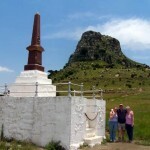 The British troops, who had progressed only 16km in 10 days – compared to the Zulu impi’s 80km in a week – pitched camp at Isandlwana on January 20th, but failed to follow standing orders to entrench, because Chelmsford underestimated the Zulus’ mobility and felt it would “take a week” to create a proper laager. 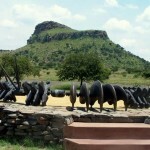 Meanwhile the main Zulu impi had encamped in the hills near Babanango and on 21st January they moved to the Ngwabeni Valley, planning to attack on the 23rd but they were discovered by a scouting party. Chelmsford then took 2 500 men and set off to find and attack the main Zulu force. He left 1 300 men and two cannon to defend the camp. 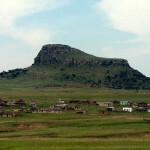 The main Zulu force was spotted by a cavalry scouting party on the morning of the 23rd January, and that led to the first skirmishes. The impi overwhelmed the British forces by sheer weight of numbers and, in a strange twist of fate, in the middle of the battle the scene was darkened by a solar eclipse. When the fighting was over, almost all 1 300 British troops had been killed, with a similar number of Zulus falling during the battle. The total British losses included 1 000 Martini-Henry rifles, two field artillery guns, 400 000 rounds of ammunition, more 1 000 draught animals and 130 wagons. It was a dramatic defeat for the British army.